(Blood Bank & Blood Component Separation Unit), Nutritionist posts. There are total 27 vacancies available in DHFWS Malda Recruitment, filled through walk in interview. Candidates applying for Medical Officer may attend Walk in Interview held on 22-11-2017. Qualified candidates interested for other posts can collect the application from the CMOH office or download from the DHFWS official website www.wbhealth.gov.in. Applications forms in prescribed form should be reach to the Office of the Secretary, DSFWS & CMOH, Malda before 24-11-2017 through post. Candidate selection is based on Qualification marks & experience, written exam/ Computer Test and Interview depends on the post. 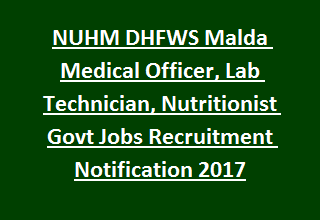 For detailed information regarding DHFWS District Health & Family Welfare Samiti, Malda Recruitment Medical Officer, Lab Technician, Nutritionist Vacancy details are mentioned below. Walk in Interview date: 22-11-2017 at 10.30 AM. Total vacancies available in DHFWS Malda Recruitment are 27 posts. Medical Officer: MBBS from MCI recognized Institute with 1 year internship (Compulsory). Lab Technician: Higher Secondary (10+2) examination from any recognized Board/ Institute with Chemistry, Physics and Mathematics/ Biology. See the District Health & Family Welfare Samiti notification for other posts qualifications. Selection of candidates applying for DHFWS Malda Recruitment will be based on Marks Percentage in higher qualifications and Experience/ written test/ Computer Skill test/ Interview depends on the post. Walk in Interview date for Medical Officer Jobs which will be held on 22-11-2017. Medical Officer: Total marks are 100. Lab Technician (ICTC): written test- 70 marks, Computer Test- 20 marks, Interview- 10 marks. Written test- 70 marks, Academic Qualification- 10 marks, Post Qualification Experience- 10 marks, Interview- 10 marks. Application fee for reserved candidates is Rs. 50/- . Interested candidates have to submit application in prescribed form through post before 24-11-2017. Download the Application from the official website www.malda.gov.in/ www.wbhealth.gov.in (OR) can collect from the office Notice Board.